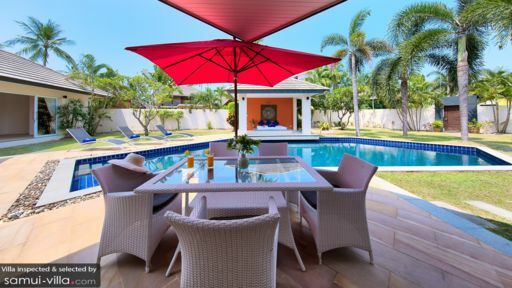 Villa Lipa Talay Neung is a three bedroom beach haven for the tired and overworked urban dweller who wants to sink their toes into fine white sand, sip on some mango juice while lounging by the pool, and get a glorious night’s sleep. If you feel tired and want to stay somewhere that will rejuvenate and revive your spirits, then Villa Lipa Talay Neung on the island of Koh Samui in Thailand, might be the perfect place for your next holiday. There are three comfortable guest bedrooms here at the villa with wooden furnishings, a good view of the garden and pool, and ample space that, when combined, create a perfect respite from your day out spent lounging on the beach or in the cool blue water. Each bedroom has easy access to the pool and all have king size beds that will let you get a rejuvenating eight hours of rest. Each bedroom also has an en suite bathroom with a bathtub and shower. In the mornings, step onto the wooden pool deck for your stretches or take a dip in the inviting swimming pool. As the sun peeks over the clouds, you can lounge on one of the three sun beds or lay back and devour a good book on the large comfortable cushion in the open air gazebo. Looking to ease away your stress? You can have a relaxing massage in this gazebo too. In the evenings, enjoy good conversation and sumptuous food in the four seater outdoor dining area for an alfresco dinner. The beautiful night sky will only be a wonderful addition to the relaxed setting. Villa Lipa Talay Neung’s living area is designed as an open space where the lounge, dining, and kitchen can coexist in perfect balance and harmony: it will definitely make you feel more relaxed and at home. Overlooking the pool, right in front of the glass sliding doors, is the lounge area with its comfortable cushioned wooden sofas and coffee table. Here you can have an afternoon snack while enjoying the view of the outdoors. In one area of the space is the flat screen TV where you can spend entertaining evenings watching TV with your loved ones. To complete the space is a six seater chic wooden dining table and a modern kitchen that will enable you, or the chef should you opt for one, to prepare some delicious meals. 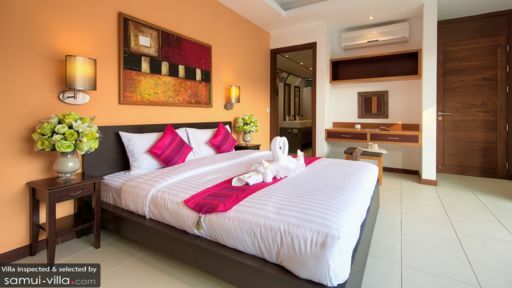 The staff here at Villa Lipa Talay Neung are friendly and attentive to your needs. The concierge team, along with the multilingual guest manager, will be happy to help you arrange your itinerary, transportation, and even tours around the island. Should you need a private chef or a soothing massage, the team would also be happy to arrange these for you. However, additional costs would apply. The team here at Villa Lipa Talay Neung will strive to bring you the best of Thai hospitality, making this a vacation you will never forget. 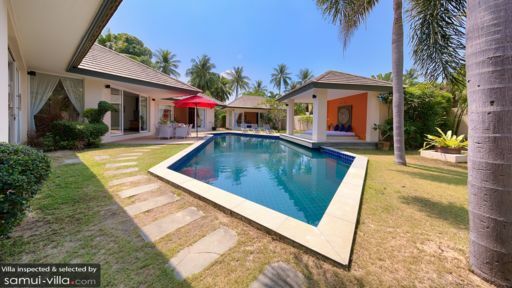 Villa Lipa Talay Neung is located on Koh Samui Island, near the famous white sand beach of Lipa Noi. While the water is shallow and the sand is fine, Lipa Noi beach is a pleasant spot because it attracts fewer crowds, which is perfect if you want a calm and relaxed atmosphere. While the beach provides fantastic views, the villa also fronts five small islands that can be seen in the distance. Wherever you decide to spend your time, this villa is perfect for guests that want a quiet relaxing home near the sea. If you ever get hungry while on a day out in the beach, there are a few restaurants in the area. Alternatively, the bustling area of Chaweng is a 40 minute drive away while Lamai is only 20 minutes away. The house is lovely in a quiet area. A rental car makes life easier however taxis have no problem getting to and from the villa. It's a one minute walk to the beach. The house manager was awesome. He arranged an amazing chef for a private dinner at the villa, massages and transport. His communication was prompt.